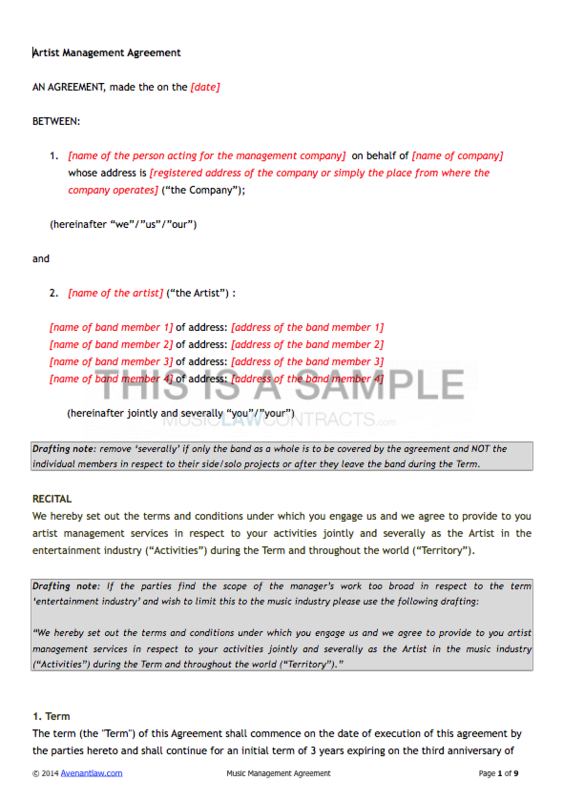 This is a template for an exclusive artist management contract for a term of three years. This agreement sets out the conditions in which a manager engages an artist in respect to their services as recording artist, songwriter, and composer of music. Give advice in connection with image, branding, advertising, trends and publicity. Promote and further the artist’s career. Seek opportunities to exploit the artist’s activities and the related products. Ensure that payments are collected and negotiate third party contracts. Work actively to help secure record and publishing deals (if applicable). The artist’s duties include carrying out to the best ability and in a punctual and sober manner all agreements, engagements, performances and promotional activities obtained by the manager. The manager’s commission is defined as 20% on gross profits with the exception of touring and merchandise activities on which commission is calculated on net profits. Manager is also able to reclaim agreed expenses incurred while carrying out his or her duties as manager. This agreement includes drafting comments and notes to help you understand what all of the clauses mean, and how each section needs to be filled out. While it’s strongly advisable to have an attorney customise your agreement to your state or region’s specific legislation, we’ve given you a head start by including three variations of the artist management contract; an Australian, US, and UK version.